Arriva drivers in North Yorkshire, Cleveland, Teesside and Durham have called off a planned 10-day strike over pay, after the Unite union reached a settlement with management. The new deal will see a reduction in the time (from five years to three years) it takes Arriva Durham area drivers to reach a new top pay rate of £10.60 an hour. There are also hourly rate hikes for drivers with fewer than three years’ service, with all increases being backdated to March 2018. The pay package will run until March 2021. The strike was due to begin on Sunday 27 January, but bus services are now expected to continue uninterrupted, with the threat of further disruption ‘eliminated’ according to the operator. Arriva said that they had ‘hammered out’ the deal with members of Unite last week, which was then put to drivers in workplace ballots on Wednesday and Thursday. The pay offer was accepted by the majority of drivers, ending fears of industrial action. 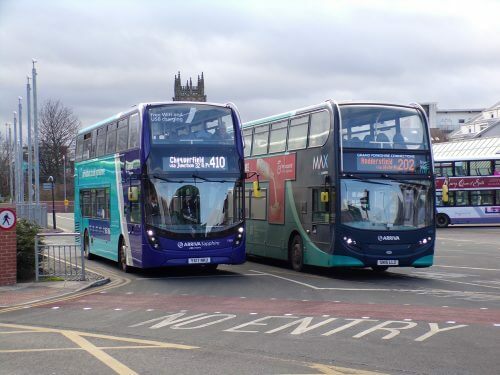 Nigel Featham, Regional Managing Director at Arriva Yorkshire and Arriva North East, commented: “In the end, everybody emerged with a positive result. Unite Regional Officer Ray Sanderson added: “We would like to pay tribute to our members for the strong solidarity they have shown during the course of this dispute, which has helped enormously to reach the settlement we now have. “We look forward to a constructive dialogue with the management going forward for the benefit of the travelling public and our hardworking members.